Dubai Chamber recognises that healthy and vibrant communities are key to sustaining a healthy and vibrant business community. 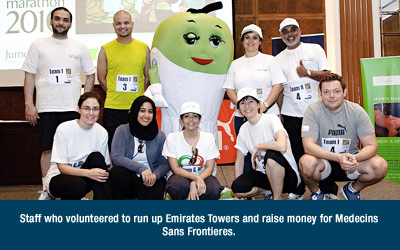 We work hard to encourage a number of community initiatives and support various causes. This helps us improve society, develop the skills of our employees, enhance the practices of businesses, develop job skills among youth and encourage entrepreneurship in Dubai while also fulfilling our mission. Each year we support a number of causes in cash or through the provision of facilities and the time of our staff. This includes fundraising and supporting various organisations working to support special needs, chronically ill children, disaster victims, our local labourers, job skills, entrepreneurship and sailing community. 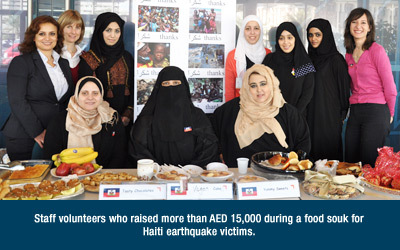 Our employees also engage in various activities like giving gifts, donating blood, charity souks, selling raffle tickets, sharing knowledge on sustainability, participating in charity challenges and more. We also regularly train staff about UAE culture and language, so that they can better integrate and contribute to this country, and endorse various local and global campaigns like Earth Hour, Public Transport Day as well as World Health and Safety at Work Day. Our biggest contribution to the community remains our ongoing support to the University of Dubai which we founded in 1997 to develop local business talent. This includes providing 47 student scholarships, a campus and other facilities to assist this institution in developing hundreds of individuals each year.